The #1 spy themed bar & restaurant in Chicago welcomes guests of all ages to experience the world of espionage. Your mission begins when you pass the ultimate test: locating the Red Door. Once you have located our must-try restaurant in Chicago, be prepared to prove how covert you can be. If you can’t provide us with the correct password you will need to pass our fun clearance test to prove you are not a double agent. Never fear, once inside you will enjoy all the perks of being a secret agent at the most fun restaurant and bar in Chicago. The SafeHouse is a family friendly & fun restaurant in Chicago! Kid-friendly before 9pm, SafeHouse is guaranteed to keep everyone entertained with interactive gadgets and espionage. The total spy experience includes scavenger hunts, magic, delicious entrées and more. The dining experience will enrich you and your family's palettes and enhance your spy skills. All junior spies will also receive a souvenir color changing cup and an undercover activity guide before their meal to keep them occupied the whole time! 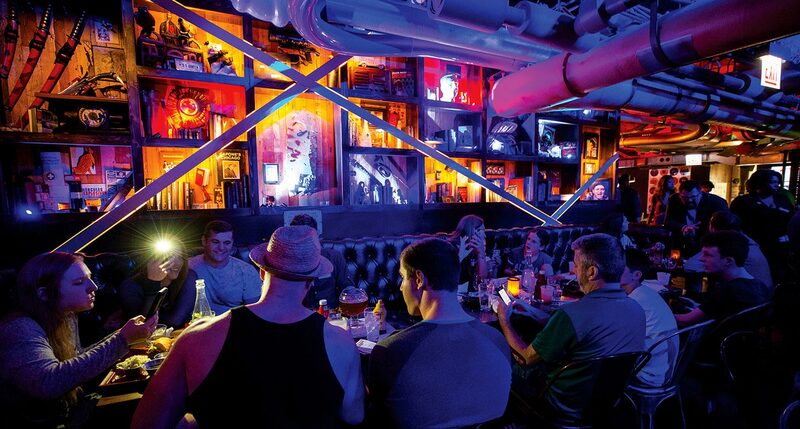 Grab your fellow agents and experience Chicago nightlife at the #1 themed bar in downtown Chicago! With live entertainment, DJ’s, dancing and specialty cocktails, we are a must-try restaurant; we were even named the most 'Instagramable' restaurant in Chicago! Bring your I.D to see what the SafeHouse has to offer, but don’t worry; we will keep your identity a secret. "This was my second time here and my first time bringing my little brother. He loved every moment of it! I would like to shoutout Agent Enigma. All of his magic tricks blew away my brother. We were in the area for the lights festival but my brother said that the highlight of his night was watching Agent Enigma perform magic tricks. Also a huge shoutout to Agent Tinie, our awesome server! He was very attentive and very friendly. The food and service were really top notch. I would not hesitate returning in the near future."